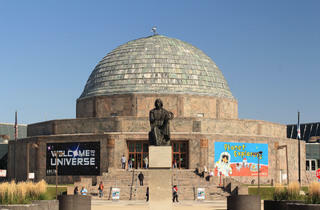 Everything you need to know about visiting the Adler Planetarium (1300 S Lake Shore Dr, Chicago, IL 60605). 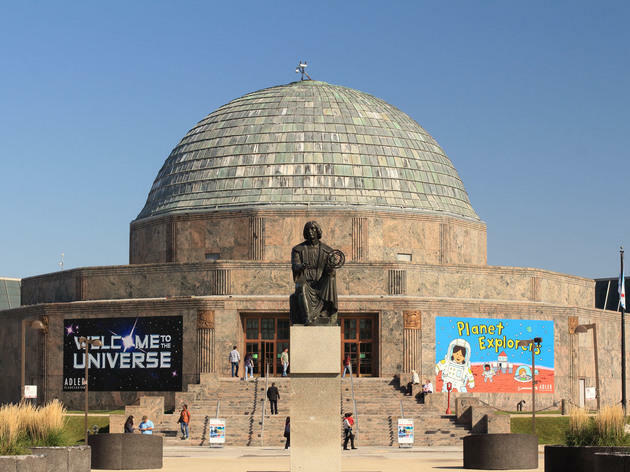 You’ll have to travel to the outermost tip of Museum Campus to visit the Adler Planetarium, but the journey seems appropriate considering this institution’s focus on out of this world experiences. Astronomy and astrophysics take the spotlight at the Adler, which features permanent exhibitions like “Mission Moon,” which documents the history of U.S. space exploration, and “The Universe: A Walk Through Time,” which posits theories on how the galaxy was started. Visitors can also look through the telescope in the Doane Observatory or take in Chicago skyline views outside of the museum on Northerly Island. No trip to the Adler is complete without taking in a show in the museum’s Grainger Sky Theater. Instead of simply projecting movies on a screen, this theater utilizes multiple projectors to cover the surface of a 70-foot-diameter dome, filling your field of vision and taking your on immersive journeys to other planets, stars and solar systems. Even though it’s not 3D, it’s vivid enough to make you feel as if you’re traveling through the stars. Each month, the Adler welcomes adults (21+ only) into the museum after the doors close to the public for its monthly Adler After Dark party. Each evening boasts a different theme, from a celebration of Star Wars films to a planetary prom. Visitors can explore the exhibits, see unlimited shows in the museum’s theaters, take in special programming and drink cocktails in the lobby. Our Chicago editorial team is constantly updating and reviewing the best attractions, activities and venues across the city, so that you're always in the know, with the best of Chicago at your fingertips. The Adler Planetarium was most recently updated with new tips on July 2, 2017. Weekdays 9:30am–4pm, weekends 9:30am–4:30pm. Summer daily 9:30am–6pm. It’s a bit of a hike to get to the Adler Planetarium but its SOOO worth it. Not only is the actual building amazing, but the view of the city from outside is absolutely amazing. One of my favorite things to do in the summer is bike down to the planetarium and have a picnic with some friends! The walk to the Adler Planetarium is a destination in itself. It's a great way to see the lakefront and take in amazing views of the Chicago skyline. Once you've arrived at the Adler Planetarium, check your reason with your coat and embark on a cosmic journey through space and time. Ultimately, you will leave this place feeling profoundly changed and with a deeper understanding of yourself and the universe. If not, you did it wrong.